Crimea voted on the last Sunday by the majority in favor of reuniting with Russia. However, reuniting a divided people may not have been the key motive that induced President Vladimir Putin’s firm resolve while dealing with Crimea. For a vast majority of Crimea’s Russian-speaking population, this is an act of undoing a historic blunder that occurred in 1991, when Crimea, which geographically, ethnically, and culturally is more a Russian than many regions of Russia itself, became a unit of a foreign state as the then Soviet Union broke up along arbitrarily-drawn administrative borders. In fact, the Ukraine crisis is viewed in Moscow as a continuation of the Western plan to encircle Russian military and torpedo its reintegration efforts in the former Soviet Union. The new leaders in Kiev installed with the West’s support are the same people who staged the “orange revolution” in Ukraine in 2004 and set it on the way towards the membership of NATO. As it stands that Ukraine’s induction into NATO would be a strategic catastrophe for Russia because NATO would come within 425 km of Moscow, cut off Russia from the Black Sea and the Mediterranean, and squeeze it out of the Caucasia. The West pushed President Putin too far in Ukraine, which is more than just a former Soviet state, as again proved by the recent voting, which European Union has rejected as being an integral part of the larger US-led machinations against the fast coming-up Russia to acquire the shape of Soviet Union of the not so distant past. And that signals the onset of a new Cold War between the US-led West and Russia. It is where the Russian nation was born—in medieval “Kievan Rus”—and it is still a part of the “Russian world.” The West’s efforts to bring Ukraine into its orbit were viewed in Moscow as an encroachment on Russia itself. “For Russia, it is not just a red line; it’s a solid double red line that no one is permitted to cross,” said Fyodor Lukyanov, Chairman of Russia’s authoritative Council on Foreign and Defence Policy. Ukraine is the second most powerful economy in the former Soviet Union and is a linchpin to President Putin’s plan to build the Eurasian Economic Union (EEU), a Moscow-led version of the European Union to which America has bitterly denounced as a veiled attempt to rebuild the erstwhile Soviet Union and has also expressed its strong aversion towards this effort. Apart from geo-political compulsions, Russia’s support for Crimea’s breakaway bid was driven by the important domestic considerations. The protests in Ukraine, manipulated as they were by the West, reflected the rise of grass-root civic activity against corruption and authoritarianism—the same problems that bedevil Russia and that brought thousands of anti-government protesters onto the streets of Moscow two years ago. By intervening in Ukraine, Mr. Putin sought to stop the surging pro-democracy wave from spilling over to Russia. Fortunately Crimea’s reunification with Russia solves the problem of the Black Sea Fleet, which Ukraine’s new leaders vowed to shut down and for which there is no other basing location that does not freeze in winter. Russia retains strategic grip on the region and ability to project its naval power to the Mediterranean and beyond. Although the Ukraine and the Western powers said that they would not accept the Crimean reunification with Russia, Moscow cited Kosovo’s self-proclaimed independence from Serbia as a legitimate precedent. Russia further recalled the 2010 ruling by the United Nations International Court of Justice, which ruled that unilateral declaration of independence by a part of the country did not violate International Law. Also, the example of Crimea has inspired other Russian-speaking regions of Ukraine to demand greater autonomy and more powers from the centre. If Ukraine switches from a unitary state to a federation, the pro-Russian regions will get the right to block any sharp swing of the country towards the West. Obviously, the US led West’s decision to disobey the Crimean people’s verdict is totally unwarranted and absolutely wrong. 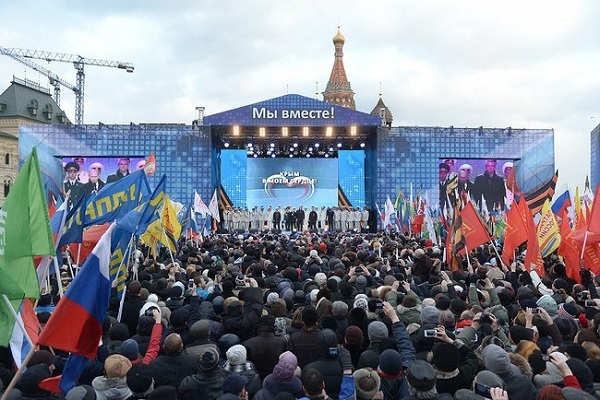 The West must be prohibited from further interfering into the Crimean affairs and, instead, the people at large should themselves come forward to stop any kind of nefarious designs cooked up by the West but too much use of force by Moscow is also unnecessary.